Once upon a time in the middle of a thick forest stood a small cottage, the home of a pretty little girl known to everyone as Little Red Riding Hood. One day, her Mummy waved her goodbye at the garden gate, saying: "Grandma is ill. Take her this basket of cakes, but be very careful. Keep to the path through the wood and don't ever stop. That way, you will come to no harm." Little Red Riding Hood kissed her mother and ran off. "Don't worry," she said, "I'll run all the way to Grandma's without stopping." Full of good intentions, the little girl made her way through the wood, but she was soon to forget her mother's wise words. "What lovely strawberries! And so red." Laying her basket on the ground, Little Red Riding Hood bent over the strawberry plants. "They're nice and ripe, and so big! Yummy! Delicious! Just another one. And one more. This is the last. Well, this one Mmmm." The red fruit peeped invitingly through the leaves in the grassy glade, and Little Red Riding Hood ran back and forth popping strawberries into her mouth. Suddenly she remembered her mother, her promise, Grandma and the basket and hurried back towards the path. The basket was still in the grass and, humming to herself, Little Red Riding Hood walked on. The wood became thicker and thicker. Suddenly a yellow butterfly fluttered down through the trees. Little Red Riding Hood started to chase the butterfly. "I'll catch you! I'll catch you!" she called. Suddenly she saw some large daisies in the grass. "Oh, how sweet!" she exclaimed and, thinking of Grandma, she picked a large bunch of flowers. In the meantime, two wicked eyes were spying on her from behind a tree. A strange rustling in the woods made Little Red Riding Hood's heart thump. Now quite afraid she said to herself. "I must find the path and run away from here!" At last she reached the path again but her heart leapt into her mouth at the sound of a gruff voice which said: "Where are you going, my pretty girl, all alone in the woods?" "I'm taking Grandma some cakes. She lives at the end of the path," said Little Riding Hood in a faint voice. When he heard this, the wolf (for it was the big bad wolf himself) politely asked: "Does Grandma live by herself?" "Goodbye. Perhaps we'll meet again," replied the wolf. Then he loped away thinking to himself "I'll gobble the grandmother first, then lie in wait for the grandchild!" At last, the cottage came in sight. Knock! Knock! The wolf rapped on the door. "Who's there?" cried Grandma from her bed. "It's me, Little Red Riding Hood. I've brought you some cakes because you're ill," replied the wolf, trying hard to hide his gruff voice. "Lift the latch and come in," said Grandma, unaware of anything amiss, till a horrible shadow appeared on the wall. Poor Grandma! For in one bound, the wolf leapt across the room and, in a single mouthful, swallowed the old lady. Soon after, Little Red Riding Hood tapped on the door. "Grandma, can I come in?" she called. Now, the wolf had put on the old lady's shawl and cap and slipped into the bed. Trying to imitate Grandma's quavering little voice, he replied: "Open the latch and come in! "What a deep voice you have," said the little girl in surprise. "The better to greet you with," said the wolf. "Goodness, what big eyes you have." "The better to see you with." "And what big hands you have!" exclaimed Little Red Riding Hood, stepping over to the bed. "The better to hug you with," said the wolf. "What a big mouth you have," the little girl murmured in a weak voice. "The better to eat you with!" growled the wolf, and jumping out of bed, he swallowed her up too. Then, with a fat full tummy, he fell fast asleep. In the meantime, a hunter had emerged from the wood, and on noticing the cottage, he decided to stop and ask for a drink. He had spent a lot of time trying to catch a large wolf that had been terrorizing the neighborhood, but had lost its tracks. The hunter could hear a strange whistling sound; it seemed to be coming from inside the cottage. He peered through the window and saw the large wolf himself, with a fat full tummy, snoring away in Grandma's bed. "The wolf! He won't get away this time!" Without making a sound, the hunter carefully loaded his gun and gently opened the window. He pointed the barrel straight at the wolf's head and BANG! The wolf was dead. "Got you at last!" shouted the hunter in glee. "You'll never frighten anyone again. 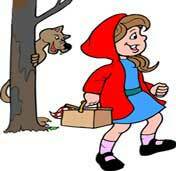 He cut open the wolf's stomach and to his amazement, out popped Grandma and Little Red Riding Hood, safe and unharmed. "You arrived just in time," murmured the old lady, quite overcome by all the excitement. "It's safe to go home now," the hunter told Little Red Riding Hood. "The big bad wolf is dead and gone, and there is no danger on the path. Still scared, the little girl hugged her grandmother. Much later, Little Red Riding Hood's mother arrived, all out of breath, worried because her little girl had not come home. And when she saw Little Red Riding Hood, safe and sound, she burst into tears of joy. After thanking the hunter again, Little Red Riding Hood and her mother set off towards the wood. As they walked quickly through the trees, the little girl told her mother: "We must always keep to the path and never stop. That way, we come to no harm!"